The Library has acquired the online resource Confidential U.S. State Department Central Files, 1960-1969, Africa and the Middle East, which includes U.S. State Department Central Files that have not been microfilmed by the National Archives or distributed by other publishers. 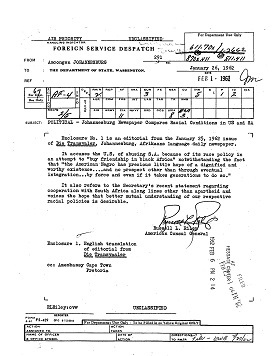 It contains a wide range of sensitive materials from U.S. diplomats in foreign countries: reports on political, military, and socioeconomic matters; interviews and minutes of meetings with foreign government officials; important letters, instructions, and cables sent and received by U.S. diplomatic personnel; and reports and translations from foreign journals and newspapers. The Africa files cover the brutal civil war between Biafra and Nigeria in the late 1960s, the 1964 Rivonia trial of Nelson Mandela and seven leaders of the African National Congress, violent protest against the South African government coupled with police crackdowns on the resistance, the troubled relationship between the U.S. and the apartheid regime, and the first years of independence in Ghana and the Congo. The files on Egypt offer considerable detail on the Egyptian political structure which was dominated by Gamal Abdel Nasser in the 1960s. Political issues are also covered in extensive detail in the files on Iran, Iraq, and Israel. Documents on Iran follow Ali Amin’s tenure as prime minister and his succession by Asadollah Alam. In Israel, State Department personnel tracked developments in the Knesset (Israeli Parliament), the political fortunes of important members of the Israeli government, and the fragile security situation faced by Israel. The countries covered in this module are: Biafra/Nigeria; Congo; Egypt; Ghana; South Africa; Iran; Iraq; Israel; Lebanon; Palestine; Saudi Arabia; the Persian Gulf States (Aden, Bahrein, Kuwait, Muscat & Oman, Qatar, Trucial Sheiks); and Yemen.